One of those things you should just never say. 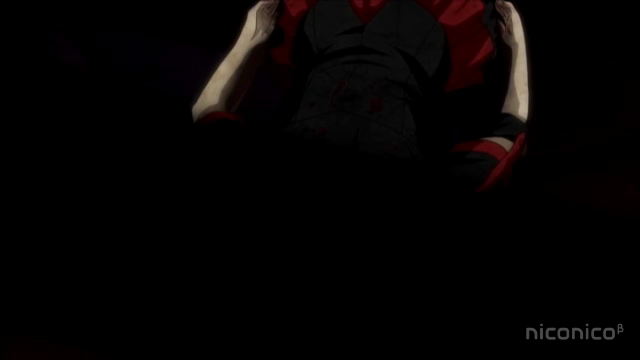 Blood-C has gone from quiet and curious to very intense. I’ve been wondering how this episode would turn out all week after last week’s cliff-hanger. The answer is this show is living up to its name. While the mystery surrounding Saya hasn’t been solved, some of the suspicious behavior has moved past the “that’s weird” point, to “that can not be a coincidence”. 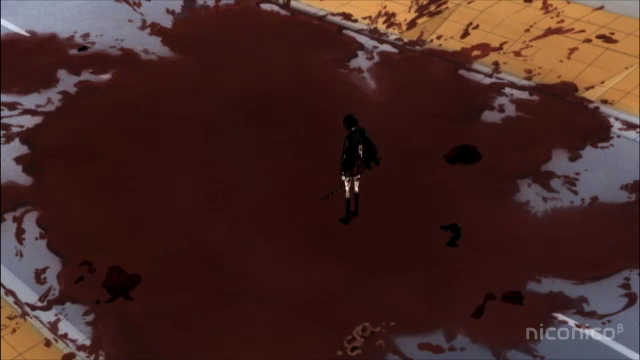 Large portions of this episode were censored for violence too graphic to be shown. First of all, I was hoping that we could see Nene’s reaction to Saya having defended her from a monster. Instead the monster chewed Nene’s head off. Definitely a dark direction to go. Saya seemed to be incapable of dealing with the tragic loss of her friend, and her father seemed to have the ability to force her to sleep — hypnosis? 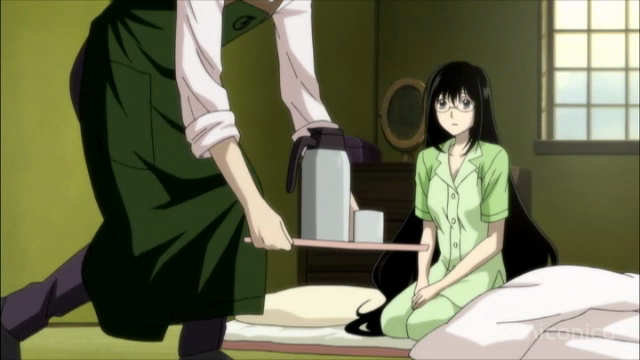 Saya wakes up to find Fumito bringing her some coffee. He says she has a fever, and after she drinks the coffee, she can’t think straight, her vision goes blurry, and she falls asleep. Now Saya goes through traumatic events almost nightly. In a way, I can see how a paternalistic (that is sexist) culture might take it upon themselves to administer a sedative to calm her nerves, but secretly drugging and lying to her goes beyond even that. There is something simply WRONG about the way Saya is treated by her father, Tadayoshi, and Fumito. These scenes are beautiful, in an abstract way. 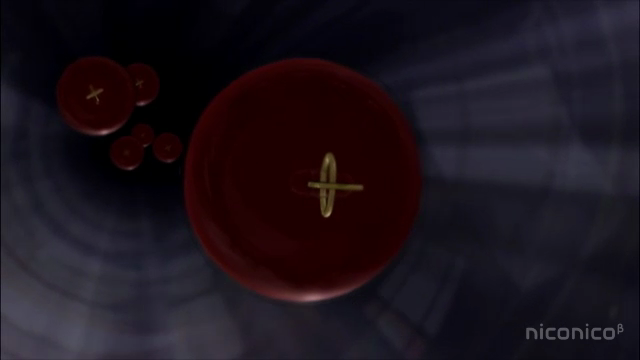 Vessels filled with blood float in some sort of tube. 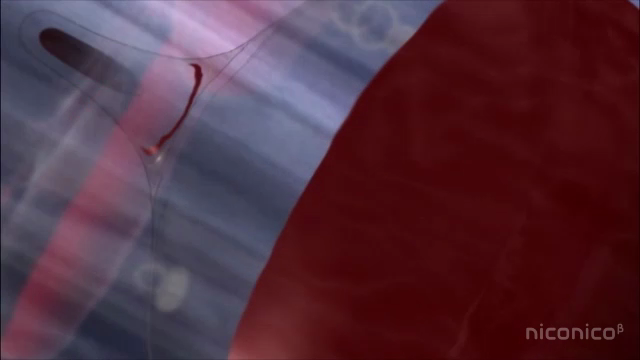 These scenes with the blood-filled vessels are still not explained. This time there is a suggestion that they are related to some sort of memory Saya might have. 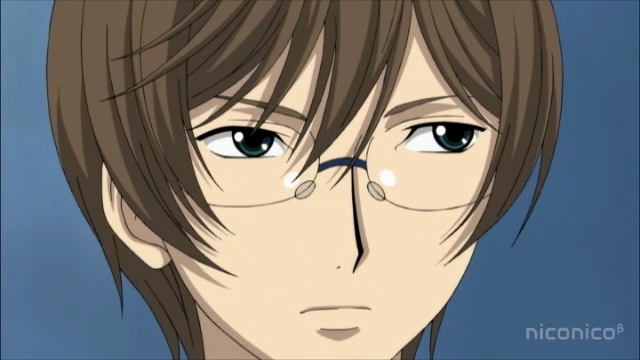 Itsuki Tomofusa: this is the first time we have seen such a mean expression on him. After staying home for the day, Saya goes in to school the next morning. She hesitates before entering the classroom, and Shinichiro Tokizane stops her with the same “if something happens, make sure to tell me” that we have heard from many other characters. This is one of those things that really doesn’t sit right. It happens too much to be coincidence, but it is hard to say what it proves. Surely at least some of the people that have said that to Saya know damned well what is going on. If the teacher doesn’t know, I would be amazed. Same for Fumito; he has to be in this as far as Saya’s father. This was the first time that Itsuki showed any sign of involvement, and honestly, he could have just been showing jealousy that Shinichiro had his hand on Saya. This enigma gets a bit more mysterious. 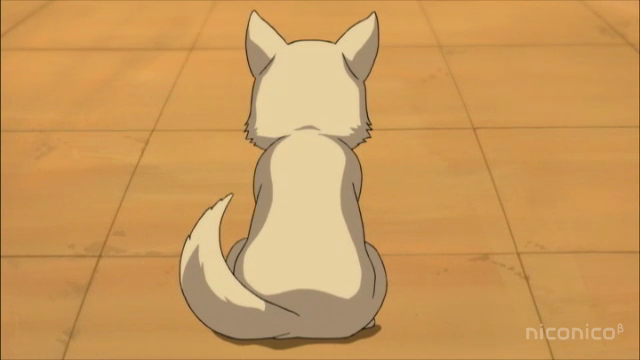 The dog (or whatever it is) that Saya keeps meeting has a brief verbal exchange with Saya, that gets interrupted by a fight. 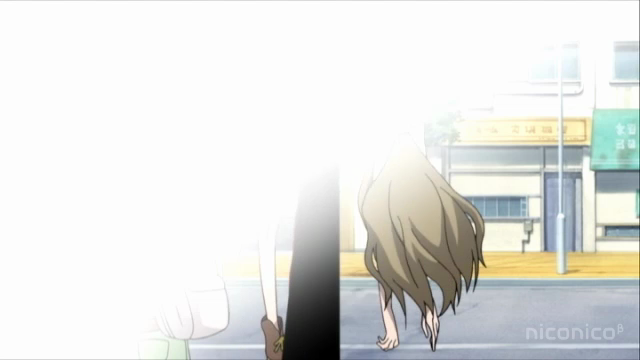 The creature appears to be observing Saya. It doesn’t attempt to harm her, but it also doesn’t show any sign of trying to assist her. 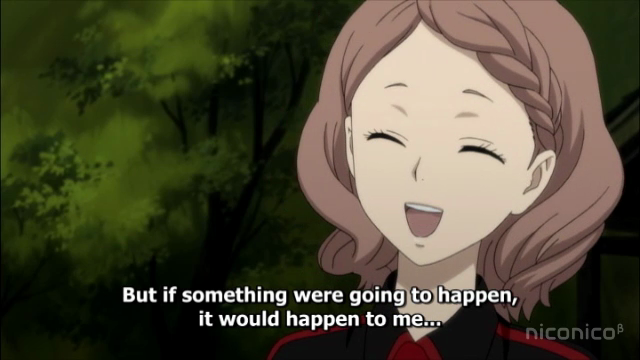 It’s final comment, “Wake up, Saya,” could be interpreted in different ways. It asks her who she promised that she would protect the town. Is it trying to warn her of what her father is doing to her? Is it trying to get her to respect the covenant? There is nowhere near enough information yet to know what is going on with this little guy. It did sound like a male voice, though, so I would say it is still quite possible that it is Shinichiro in another form. More gory violence censored. This is the second daytime attack, and both were in this episode. I wouldn't want to be caught with a katana in the middle of that. Saya fights again. This time the creature seemed to be preying upon Nono in some way. In any event, both Nene and Nono are out of the show now. This daytime battle happened in the middle of town, and several bystanders were killed in the process. As the episode ended the one thing I was thinking was, “get the hell out of there”! I have no idea how you begin to explain this scene to a policeman. They are already on the lookout for something, so a katana-wielding girl wandering around a corpse-strewn street is likely to engender some questions. For those who thought this show would not ramp up, well this episode shows that it has. The schism between the day and night has been confounded in one bloody mess by the events of this episode. Saya is still in the dark about the machinations around her (to say nothing of being drug-addled). I have a difficult time trusting her father in all of this; he is clearly hiding things from her. If the whole town is in on it, I don’t quite know where things go from here. Fortunately, with six episodes remaining, they should be able to develop this into an interesting ending. Daaammmnnnn only 6 more episode left? But it’s finally getting so interesting! 😦 And everyone is so plotting against Saya! Yeah people are very suspicious in this show. I don’t know if they are plotting against Saya or just using her, but she needs to stop trusting everyone. I don’t know how far they will get. There is already a Blood-C movie being planned, so I assume they won’t resolve everything during the final 6 episodes.